Councils would publish a shelved report into north Wales care home child abuse claims in the 70s and 80s if legal advice allows, says a chief executive. Flintshire's Colin Everett says legal approval would be needed if a copy of the 1996 Jillings report is found. He says a north Wales council is likely to have the report, which was never made public because of legal concerns. He spoke before Conservative peer Lord McAlpine called allegations linking him to historical abuse "wholly false". If a copy of the report is located, Mr Everett said the council would have to take similar legal advice to the now disbanded Clwyd County Council to see how much of it could be disclosed. "Our position as a council will be, as with the other councils, that we want to act in the spirit of that legislation [Freedom of Information] and, providing the legal advice allows us, we will be supporting a form of public disclosure," he said. The scandal re-emerged last week after victim Steve Messham called for a new investigation claiming a subsequent report by Sir Ronald Waterhouse in 2000 had not uncovered the full scale of the abuse. Home Secretary Theresa May this week launched a new police inquiry into the abuse allegations. Claims of alleged abuse centring on children's homes in north Wales, and specifically the Bryn Estyn home at Wrexham, began to emerge in the 1990s. 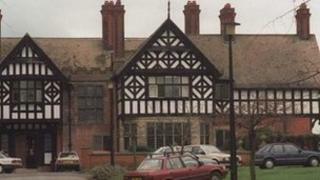 North Wales Police investigated the claims in 1991, and seven former care workers were convicted. Media captionCynon Valley MP Ann Clwyd said she spoke to four Bryn Estyn child abuse victims and found their stories "harrowing"
Mr Jillings said his report never saw the light of day because the council's insurers felt it could result in individual children suing for compensation in a way that could have been costly. The insurers have said that after taking legal advice, it was considered that the report was not suitable for publication. Mr Everett said if a copy of the report existed, Flintshire council would take legal advice as to how much of the report it could disclose. "We have all the north Wales councils working through their secure archives to establish who holds what," he said. "It's very probable that one or more of the councils holds a copy. "At the same time, we're taking legal advice on whether the report, depending on its contents which many of us have never read because of its age, can be disclosed in the public domain and we will be doing that urgently." The council, in support of the new police inquiry into abuse allegations, is also establishing what records are held across the region. MP Ann Clwyd said she would welcome publication of the Jillings report and would like a copy sent to her. "In 1991, when North Wales Police began the investigation into these allegations and obtained just under 2,600 statements from individuals, those only resulted in eight prosecutions and seven convictions and they were all former care workers," she said. "But of course people have continued to say the abuse was on a much greater scale than those convictions suggest. "If all those statements were taken and contained I believe as appendices in the Jillings report, then the report ought to be made public. I think it's absolutely crucial." On Friday morning, Lord McAlpine said allegations linking him to alleged historical child abuse were "wholly false and seriously defamatory". Claims of alleged abuse were highlighted by the BBC's Newsnight programme last Friday when Mr Messham said the Waterhouse inquiry had uncovered only a fraction of the abuse. Mr Messham also said he had been repeatedly abused by a senior political figure who served during the Thatcher era. Lord McAlpine, former party treasurer, has now released a statement saying he had visited Wrexham "only once" and that he had been in the company of an agent from Conservative Central Office. He said he had "never" been to the children's home linked to the claims. He said he wanted to "publicly tackle these slurs and set the record straight". New claims have also made by Sian Griffiths, who worked for the former Clwyd County Council, about how the Waterhouse inquiry was carried out. Ms Griffiths, who ran the council's office administration for the Waterhouse inquiry, claimed on Channel 4 News that during the inquiry Det Supt Peter Ackerley was asked to list the names of people the police had investigated and referred to the Crown Prosecution Service. But Ms Griffiths said that Mr Ackerley was made to stop by Sir Ronald Waterhouse when a high profile government name was mentioned.